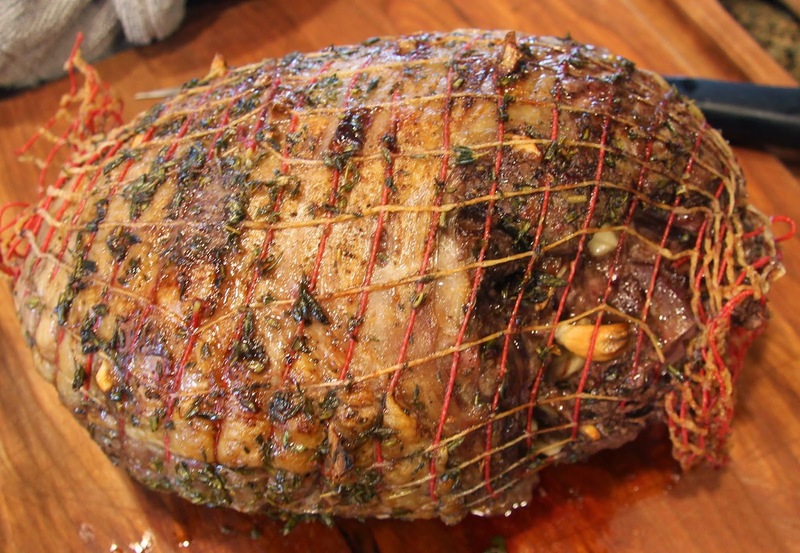 My girls loved this roasted leg of lamb I made Easter Sunday. And I’m not saying that in a superior “my kids will try anything, they especially like kale and oysters” kind of way because they most certainly are not those kids and I hope to heavens I am not that parent. A lot of celebrity chefs these days are very fond of telling parents not to cook something different for the kids and they will eat accordingly; their palates will mature at rapid speed and soon they’ll crave radishes instead of cookies. I like the spirit of the message (except for when it’s supremely condescending or delivered by those who have no children, as is often the case) but I’m here to tell you it doesn’t always work that way no matter how hard you try. Having twins, we have our own little in-house nature vs nurture experiment going on and we actually do have one who will try just about everything but the other child recoils at the thought. And they both crave cookies over anything resembling a vegetable. Nature almost always wins, in every area just so you know. So, keep trying, but stop beating yourself up about the food thing and, while you’re at it, every other “I never do enough and will never measure up as a parent” thought. Sure, the kid next door might eat spinach like a champ but he’s eight and still can’t tie his shoes. And you know what? That’s fine too! Anyway, I was almost as surprised at the enthusiasm for the lamb by both young ladies as they were. Maybe you will have the same luck. I realize kids aren’t the only ones who have trouble trying new things. I know many adults, my husband included, who have either tried lamb and hated it or have never even given it a chance. My very unscientific theory about the ones who have actually tried it is that some of them, indeed, might never like it but most of them have just had bad quality or badly prepared lamb. They also may be scarred by the mint jelly. 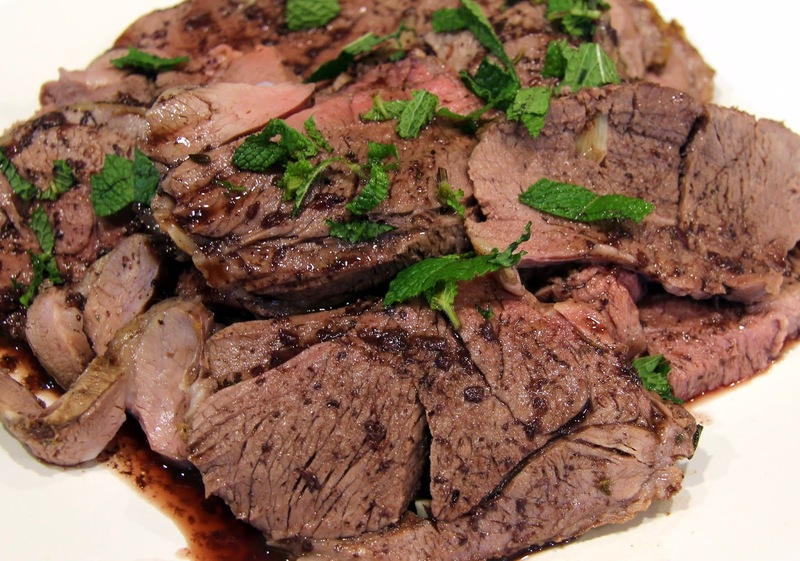 I happen to like mint jelly, but only as an accompaniment to well seasoned, well-prepared lamb. It cannot be counted on to carry (or cover up) the dish. My husband fell into the latter camp, his mom was a great cook but never got the lamb right, slathered it in mint jelly. He loves it now. This recipe serves about ten people so it’s great if you’re having company over. If you have a small group like we did, just the four of us, you will have lots of leftovers which is not a bad thing. We sliced it thinly and made delicious gyros the next night, then I chopped up the rest and stuck it in the freezer to throw in a soup or a stew. 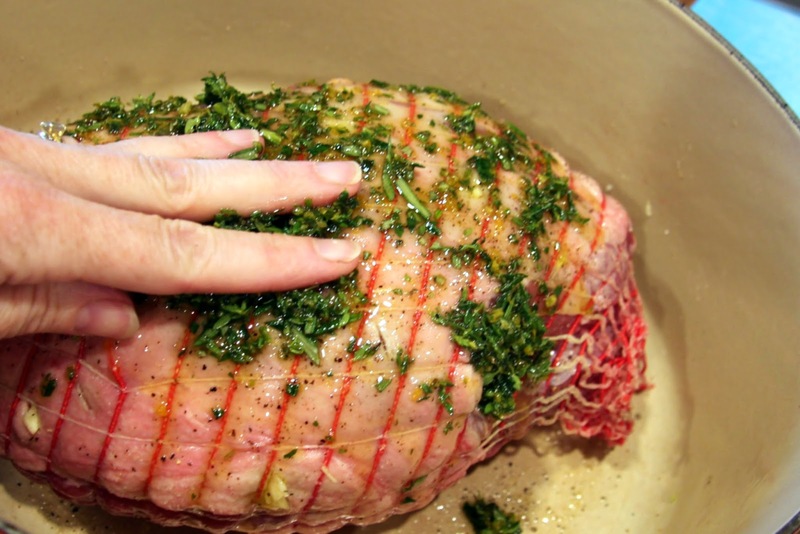 Pull the leg of lamb out of the refrigerator at least one hour before placing it in the oven. Liberally sprinkle a couple tablespoons of kosher salt all over it. 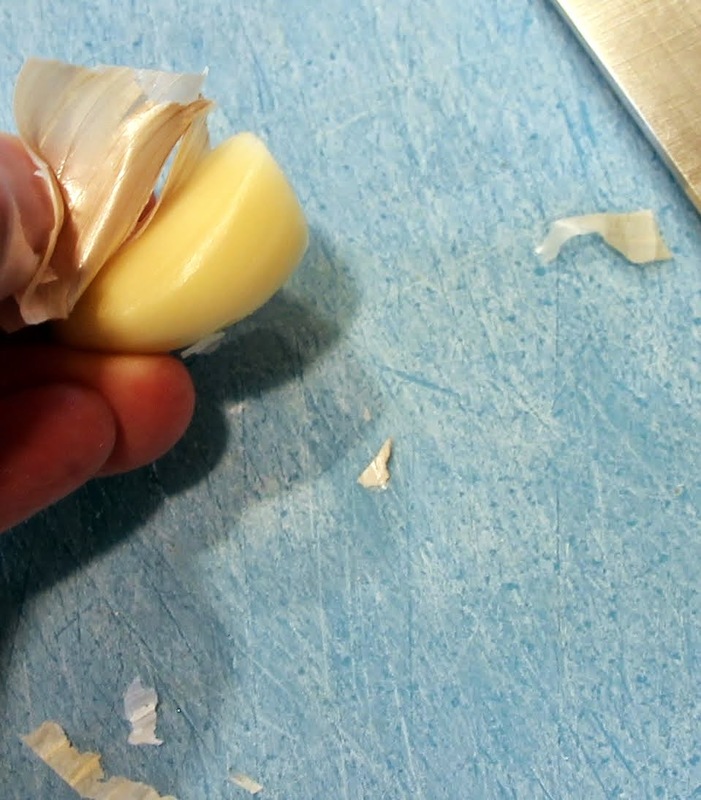 Slice the bottom off the head of garlic to release the cloves. Peel each clove by gently pressing down on it with a large chefs knife (you don’t want to crush them) then you can easily remove the skin. 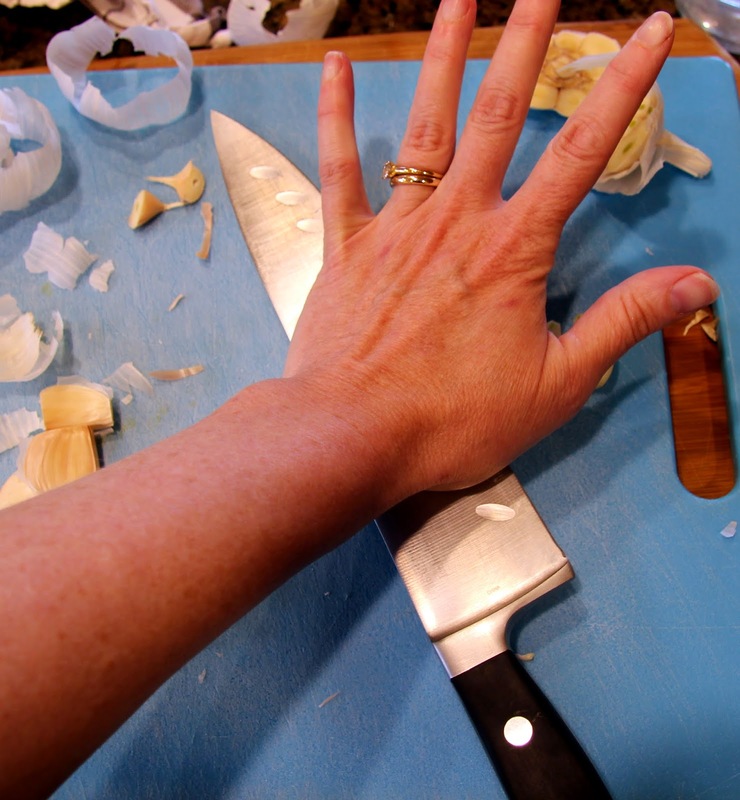 Slice each clove into 3 – 4 pieces, lengthwise. 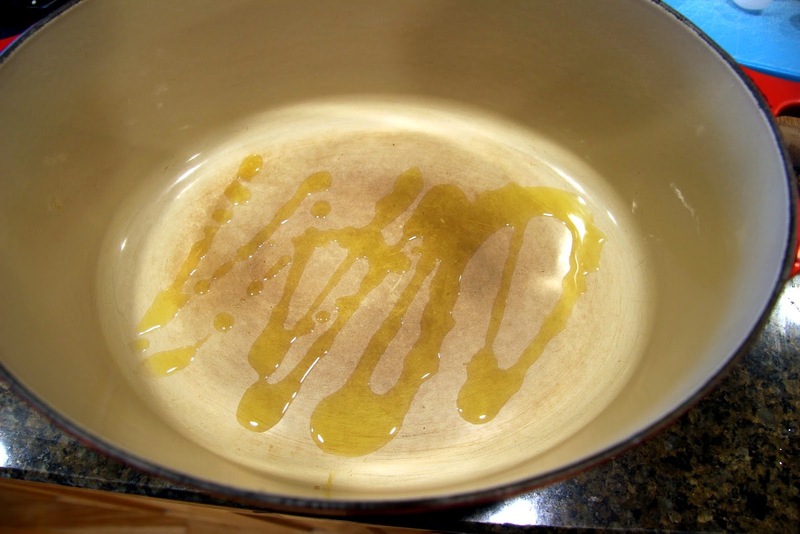 Drizzle some olive or canola oil in the bottom of a large Dutch oven or roasting pan then place the lamb in it, fatty side up, keeping the strings on. 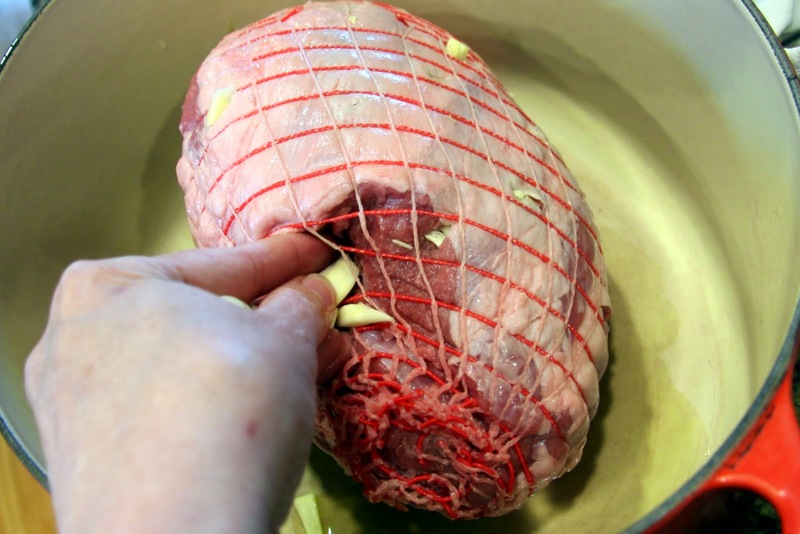 With a thin, sharp knife, make about 20 slits all around the lamb leg, top and bottom, large enough to stick a slice of garlic in. Stick garlic slices in all the slits then stuff the remaining garlic in the center. You want to make sure the garlic’s not too exposed or it will scorch so really stuff it in there. Yes, that IS a lot of garlic. 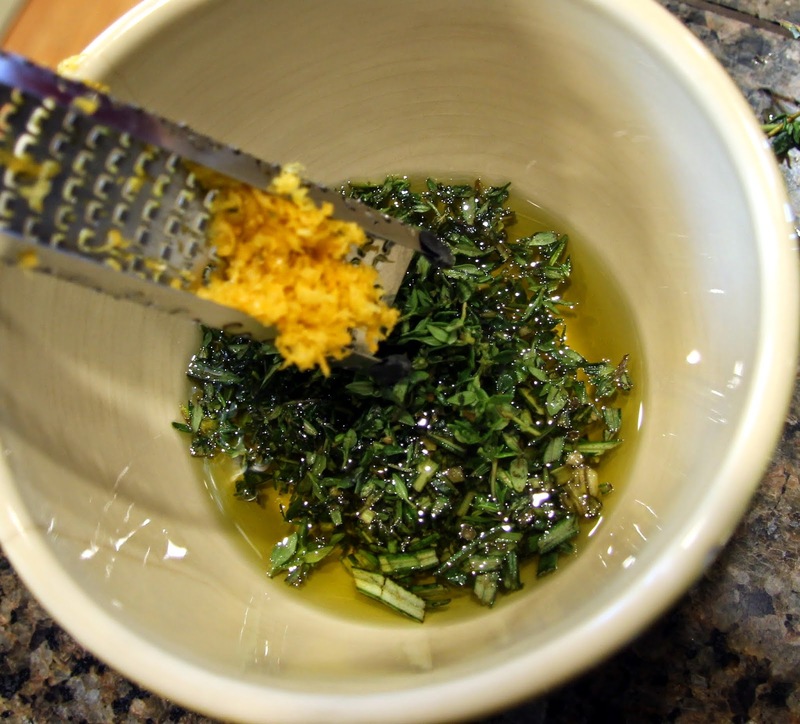 In a small bowl, combine olive oil, chopped rosemary, thyme, lemon zest, and freshly ground pepper. Rub the mixture all over the lamb. 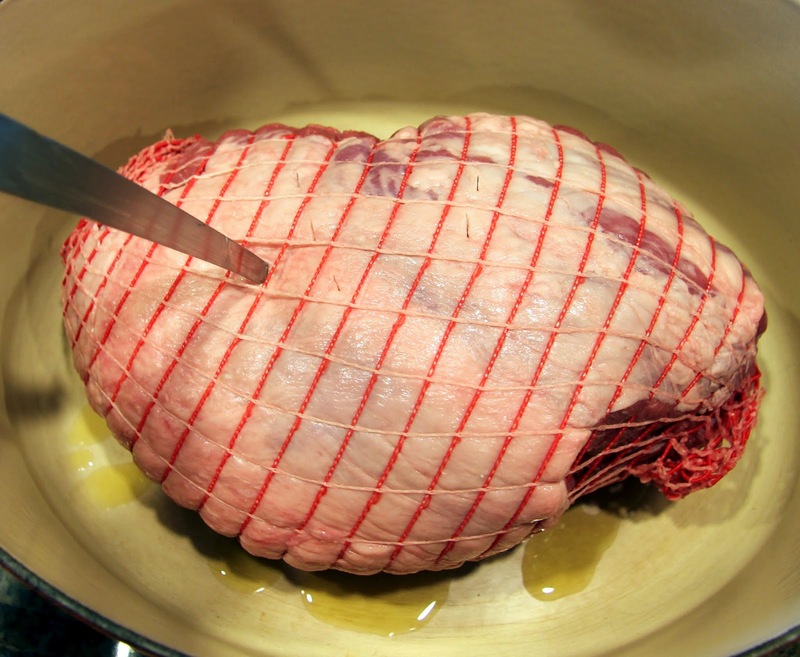 Place in oven, roast at 400F for 15 minutes to brown, then turn oven down to 250F and roast for another 1 1/2 – 2 hours or until a meat thermometer reaches 130 degrees F (medium rare) or 140 degrees F (medium), depending on how you like it. 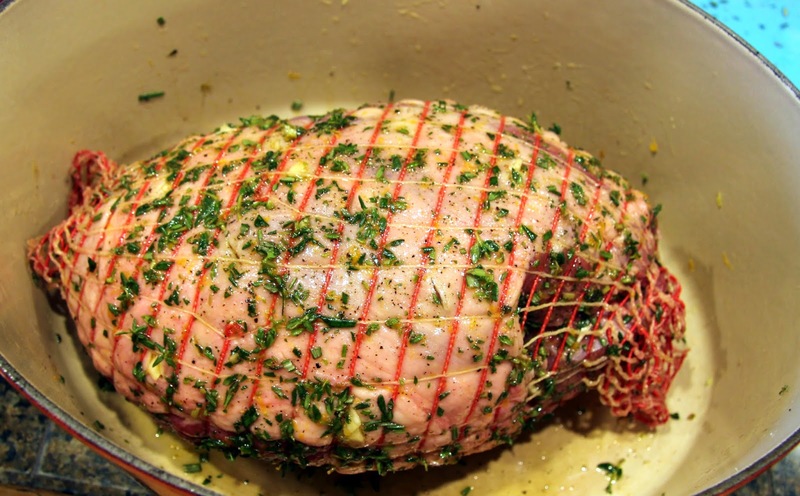 Cooking times can vary greatly depending on the size of the roast and your own oven so I suggest using a thermometer. One you can preset the temperature on and an alarm will sound when it’s done is ideal. This is the one I use All-In-One Timer/Thermometer . Of course, an instant-read thermometer will work as well but you will need to check it more often. Be sure and stick the meat thermometer in the thickest part of the roast to get an accurate reading, you might have to try a couple different spots. 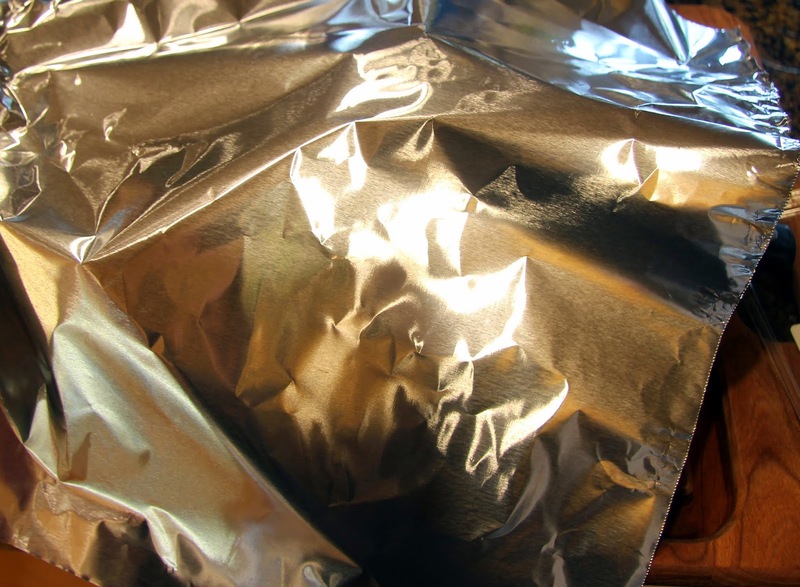 Remove the roast from the pan and place on a large cutting board to rest, covered loosely with aluminum foil for at least 20 minutes. While the roast is resting, skim as much fat as you can from the bottom of the pan, leaving the good brown bits and juices. Don’t worry if you can’t get a lot, you can skim some off the top later if you wish. Transfer pan to stovetop. 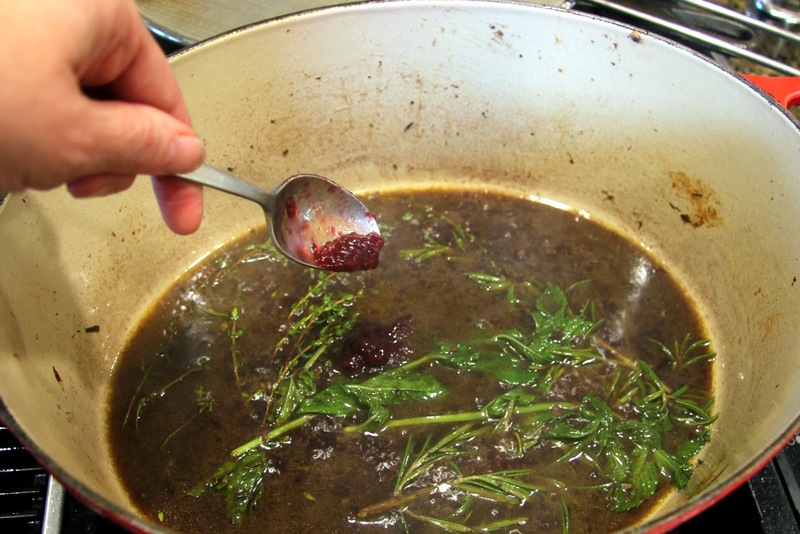 Add red wine to deglaze the pan; stir and simmer on medium-high heat until slightly reduced, about 5 minutes. 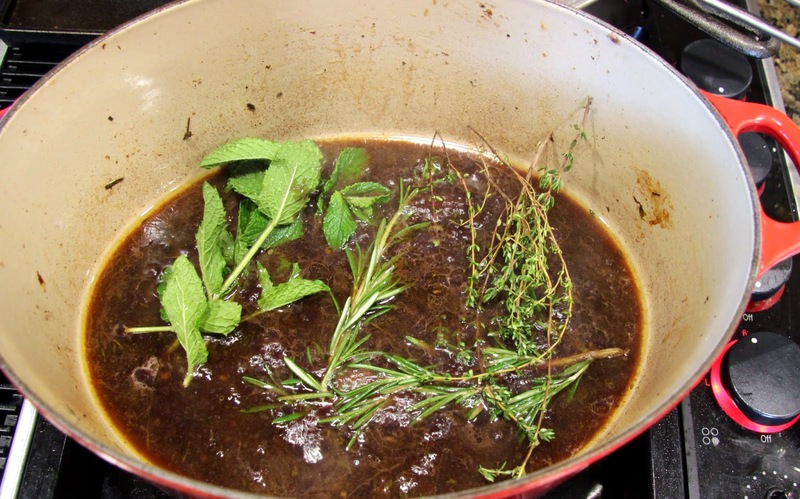 Then add the stock and fresh herbs. Bring to a simmer on medium heat and allow to cook, stirring occasionally, for 10 – 15 minutes. Add salt and pepper to your taste and add 1 tablespoon jam. Taste it before you add the second tablespoon, it may not need it if you’re using a fruitier wine than I did. 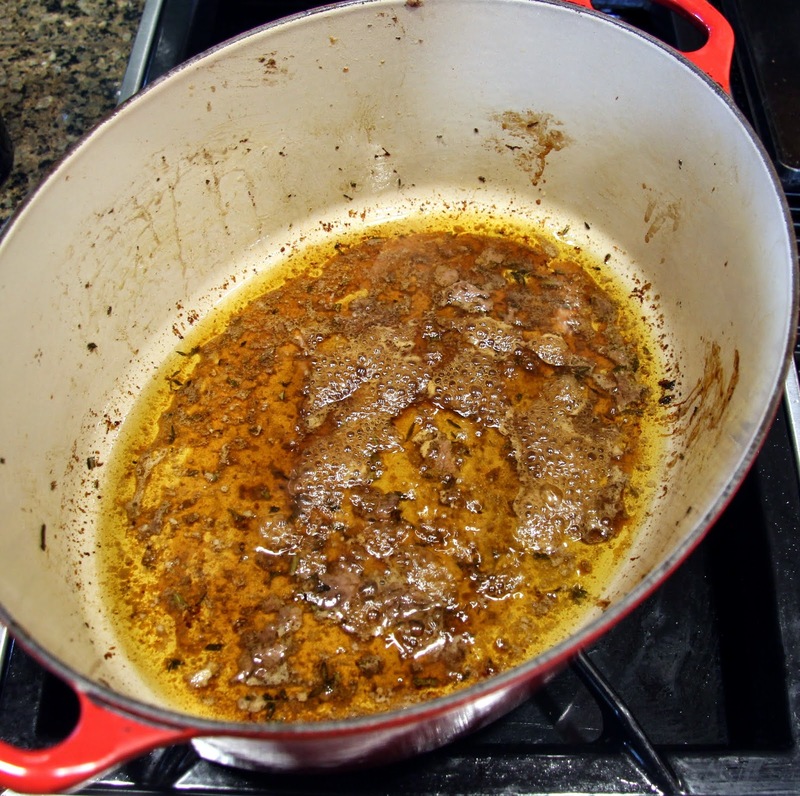 Reduce heat to low and allow to simmer slightly while you carve the lamb. Before serving, strain out the herbs. 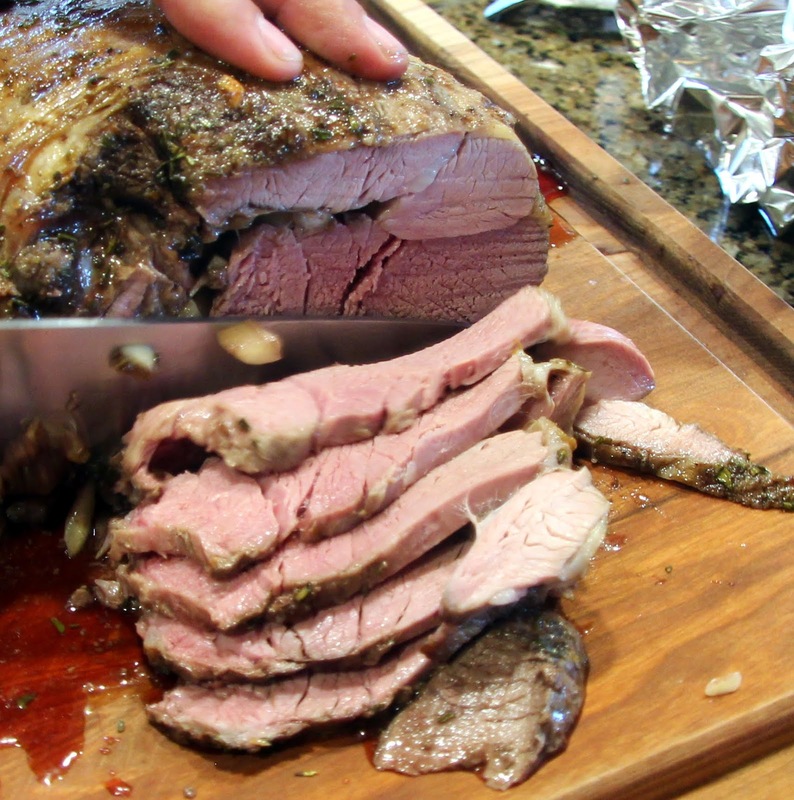 After it’s had a good rest, carve the lamb into thick slices with a sharp knife and transfer to serving platter. 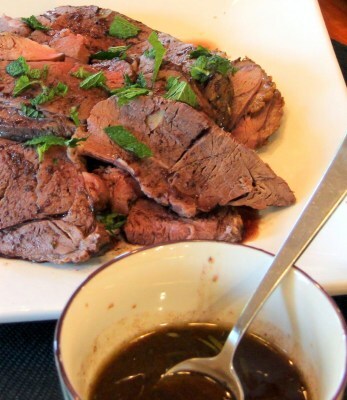 Spoon some of the au jus over the lamb and garnish with some chopped fresh mint. 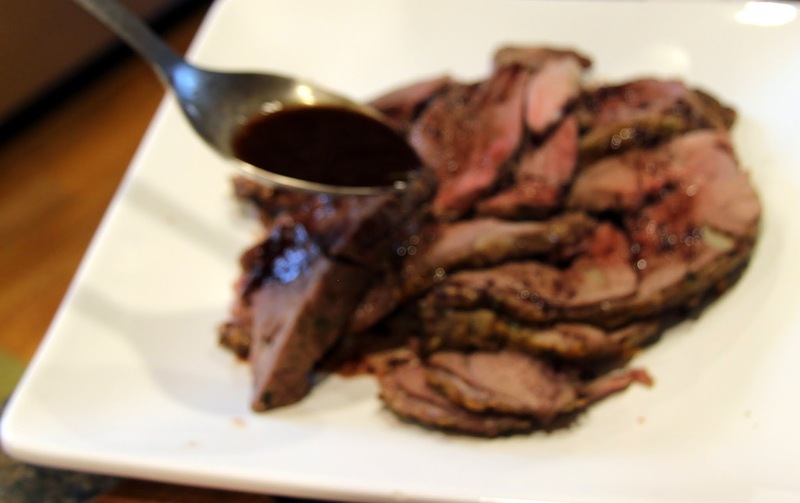 Transfer remaining au jus to a small bowl to pass at the table. Mint jelly won’t be necessary.